Choosing the perfect floor sculpture stand is not simple for anyone. Depending on your unique needs and standards, different factors will decide which stand works best. Generally, quality is most important but here are the characteristics to look for when finding a durable and versatile stand. There are many sculpture stands available in the world of art supplies. Look for a material that is lasts throughout years of use. Choose a stand that can withstand a heavy sculpture without shaking or swaying side to side. Wood or plastic legs are susceptible to rocking when something brushes against it so the best option is to find a stand with steel legs. A steel stand will not sway and is not prone to nicks and dents. Find a steel stand with a wooden top where the sculpture sits, to prevent the item from slipping or easily tipping over. 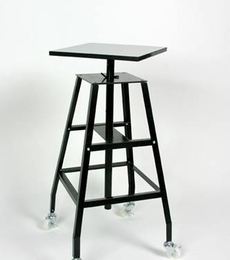 The most important characteristic for high quality easels and floor sculpture stands is reliable durability. Particularly for displaying valuable items, buying an unstable stand to save a few bucks will cost you much more in the future when accidents occur. A truly top-quality floor sculpture stand should have innovative design such as legs that slant outwards with rubber stops on the feet. This adds even more stability and peace of mind that all items on display are safe and will not falling down suddenly from a weak stand tumbling down. A display stand is not perfect without useful functionality. A rotating display top is essential for versatility. Smooth rotation means you can place the stand just about anywhere and adjust the display angle without moving or turning the entire stand itself. Find the sculpture stand that is simple to put together without advanced tools or complicated parts. Regular maintenance is also an important factor considering the sculpture is likely extremely heavy and lifting it all the time heightens the risk of damaging it. Look for a stand with wood that is easy to clean with a just simple wipe down. Most people do not have much “elbow room” in their budget to spend too much for a sculpture stand. However, settling for one with low quality puts a wrench in your pockets. Do not compromise your high standards but always look for a great deal from a reputable company and leader in art supplies.